Searching for the perfect gift to give the one who’s always on the go? We’ve got you covered. 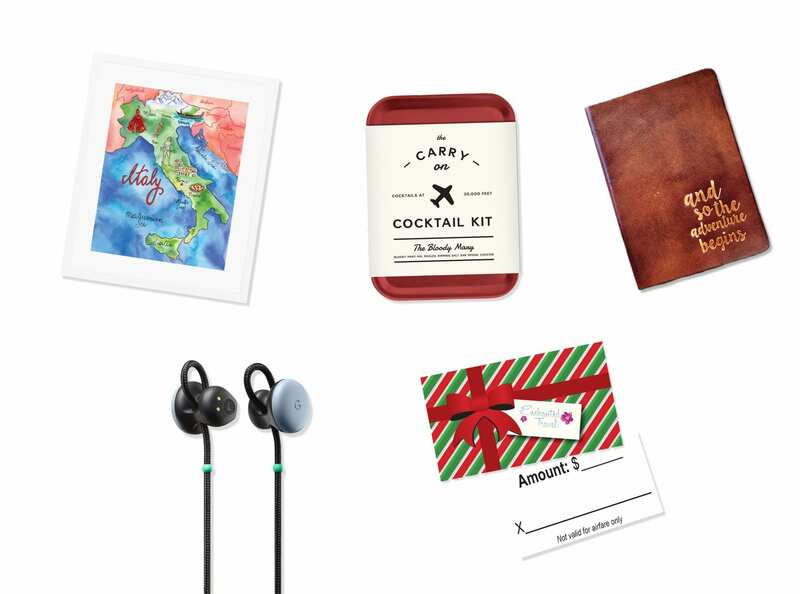 Check out our holiday gift guide for the must-have items on every travel lover’s wishlist this season! Brighten up their walls with a timeless print that inspires daydreams of a favorite place or trip. With a gallery of prints dedicated to travel, we love the whimsical pastels of Lauren Taylor Creates watercolor illustrations. From Hawaii to the Amalfi coast, you’re sure to find a dreamy scene to complete the space of any travel lover. Tasty recipes for a mid-flight buzz all in one compact case? Count us in! Choose from a variety of mixes including bloody mary, Moscow mule, and even hot toddy. With two servings included in each kit, those restless hours on a long flight just got significantly more bearable. Send them traveling in style with a sleek passport case that makes a statement. Whether you’re looking for something large enough to keep loose change and ticket stubs, or something that is more snug fitting, you can find a wide variety of cases for every style. We love this classic leather case with a gold pressed quote to spark inspiration for new adventures. For solo travelers hoping to connect with locals or someone looking to get familiar with a foreign language in the quickest way possible, Google Pixel Buds are the perfect fix. On top of the ability to translate language in real time, these earbuds are also sleek and wireless—currently available in black, white, or blue! There’s nothing more fulfilling than the gift of travel itself. With an Enchanted Travel gift card, the lucky recipient gets to choose the where and when, while they’ll still have you to thank for the memories. What gift could be better than that? The gift of travel creates a lifetime of memories. Stop in today to get your Enchanted Travel Holiday Gift Card, now available in any dollar amount. Dreaming of planning your own vacation but no clue where to get started? At Enchanted Honeymoons Travel, we plan hundreds of bucket list getaways every year. Our travel agents specialize in exactly where you’re looking to go, so that the planning process is seamless and carefree. Call us today at 402-281-3022 to learn more!